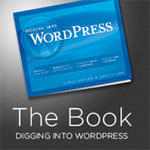 Digging into WordPress is an entirely self-published book. It's not that way because we just arbitrarily decided that self publishing was hip and that was what we were going to do. In fact, the plan early on was the opposite. Step one, we thought, was to write the book. So we did that. Then step two became find publisher to publish it, so we asked around. We talked to five (or so) tech book publishers. Just a quick post to let everyone know that printed copies of Digging Into WordPress version 3 are now sold out. The current plan is to update the book for WordPress 3.1 and then print up another batch. Thank you to everyone who already purchased a printed copy of Digging Into WordPress version 3! Digging Into WordPress Book Giveaway and Holiday Sale! To celebrate this magical time of year, we’re giving away FREE copies of Digging Into WordPress and throwing a HUGE Holiday Sale! PLUS we’re selling a limited number of slightly damaged books (scratch-&-dent) for $15 OFF.